May 19, 2015. Like the U.S., Norway has its own sort of Independence Day. 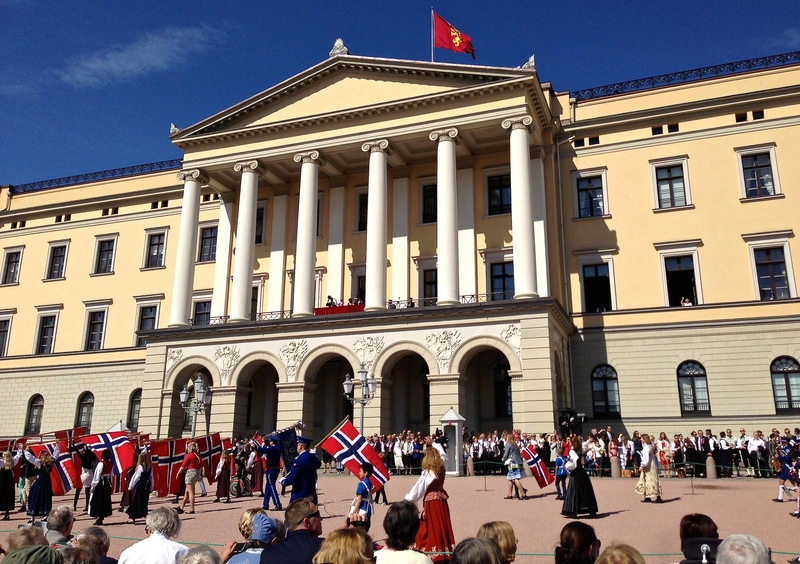 Known as Syttende Mai (17th May) or Nasjonaldagen (National Day), it commemorates the signing of Norway’s constitution in 1814 at the end of the Napoleonic War. But in actuality, Norway didn’t become independent until 1905. Yeah, it’s kinda complicated. So here’s the short version of the story…. This guy’s getting in touch with his inner Viking — the Swedish branch, which concentrated their raids in Russia and Eastern Europe. We all know about the Vikings — and by the way, the original word vikingr basically means “from the fjord” and is a term liberally applied to all raiders from Scandinavia. Over time, the Viking territories evolved into the separate countries of Norway, Sweden, and Denmark, each with their own ancient kings possessing awesome names like Sven Forkbeard, Erik Bloodaxe, Ragnar Hairy Breeches, and Harald Bluetooth (yep, the symbol for Bluetooth technology is the Viking rune for this Danish-Norwegian king). In 1397, the three countries formed the Kalmar Union to protect themselves from German aggression, with Denmark eventually controlling all three nations. Sweden broke away in 1523, and then Denmark had to cede Norway to Sweden in 1814 as punishment for having backed the wrong guy in the Napoleonic Wars. Norway didn’t like this situation much and made a bid for independence by writing its Constitution (creating a limited monarchy and parliament) on May 17, 1814. In response, Sweden invaded Norway, which surrendered on August 14 of that same year. 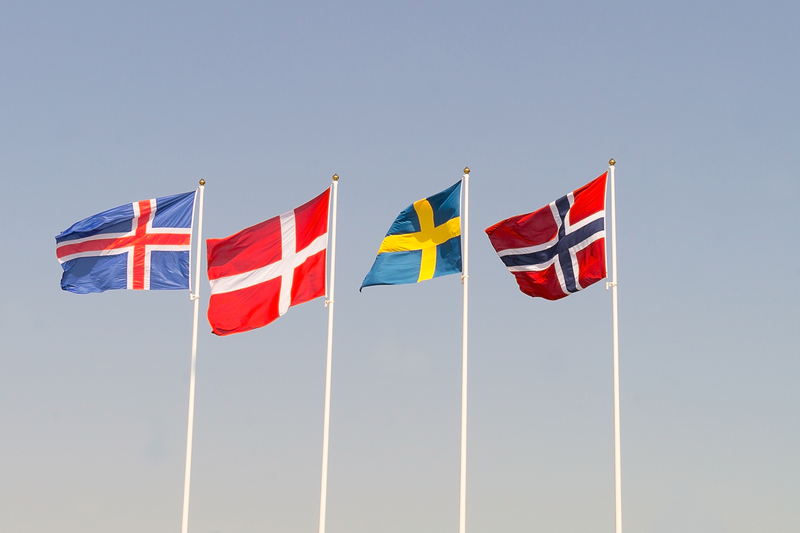 The flags of Iceland, Denmark, Sweden, and Norway. The latter three have the same “Dannebrog” design as a result of Denmark’s control over the Kalmar Union. (Iceland later joined the Scandi design theme, since it began as a Viking colony.) Norway’s red, white, and blue theme was inspired predominantly by the French flag and its theme of Liberté, Égalité, Fraternité. The relationship between Norway and Sweden remained dicey until, hoping to avoid a war it could little afford, Sweden finally decided to give Norway its independence in 1905. I get the impression that on the whole, Sweden didn’t think it was losing much, as Norway was an extremely poor country — but I bet they’ve regretted that decision since oil was discovered in Norway’s North Sea holdings during the 1970s. Anyway, I tell you this whole story because it explains a lot about certain customs related to National Day, and also why Danes, Swedes, and Norwegians aren’t necessarily all that fond of one another (which might be putting it a bit mildly). The Grand Hotel goes all out with its patriotic swagger. 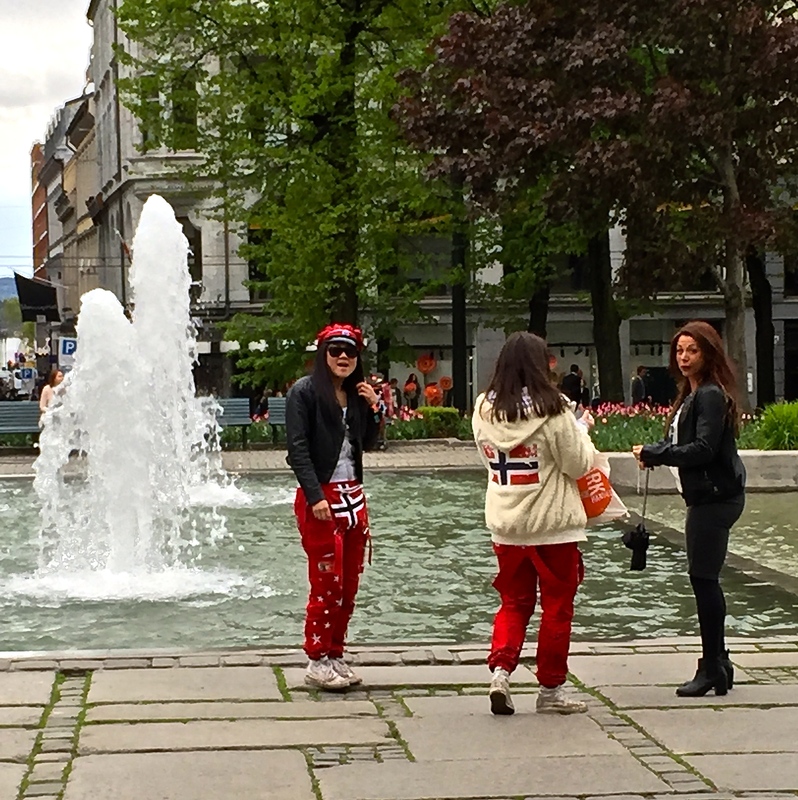 So now that we’re caught up to the present day historically, let’s talk about how Norway celebrates May 17th. In some ways, it’s not so different from U.S. traditions. Norwegians wave flags, host huge parades, and drape red, white, and blue banners all over everything. But it’s the differences that really stand out. First of all, while our Independence Day parades often feature big military displays, Norway’s armed forces take a back seat — on purpose. It’s really all about the kids. Schoolchildren marching with their fellow students … and a few long-suffering parents. 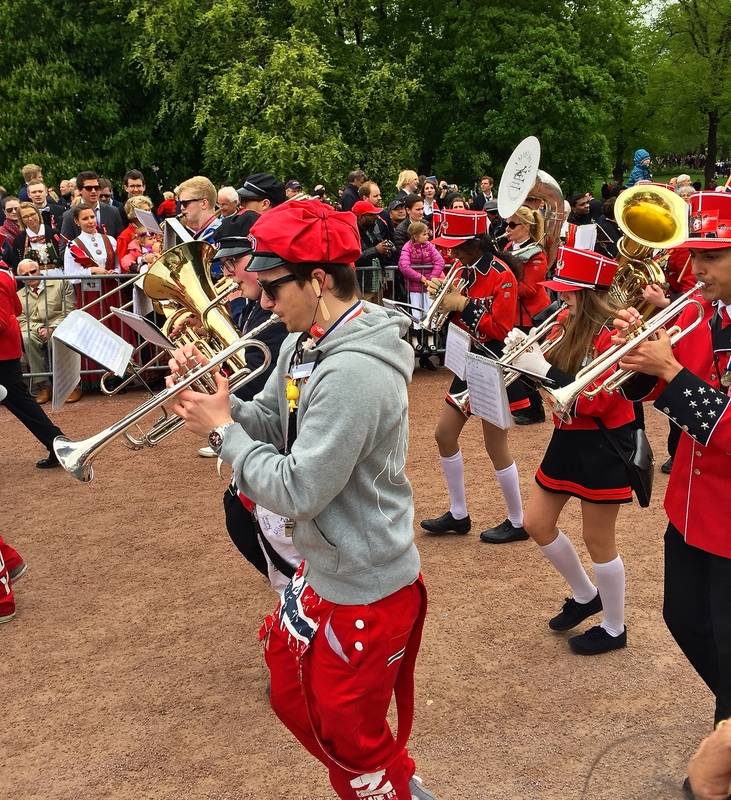 Supposedly, students staged the first May 17th parades as a form of protest against Sweden’s denial of the Norwegian Constitution, and it’s been a youth march ever since. I’ve also heard that after World War II, Norway wanted to avoid the rather fascist appearance of big military parades by keeping the event child-oriented. And so to this day, National Day features groups of children waving banners representing their schools in a sort of friendly competition to see who has the most school spirit. On National Day you’ll also see lots of graduating high-school seniors wearing russ overalls. Some say this is due to mimicking German schoolboys who once visited the country, but the better story harkens back to the bad blood between Danes and Norwegians. 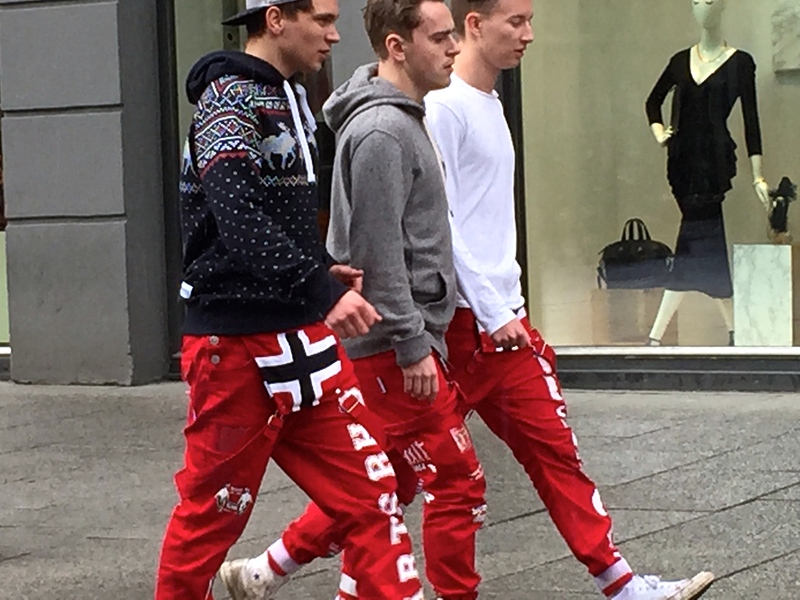 Supposedly, when Norway was under Danish rule, Norwegian students sent to Denmark for school were forced by their fellow Danish students to wear bright red overalls (a symbol of their country-bumpkin roots) for their entire freshman year, no showering or laundering allowed. Girls in their russ overalls and caps. Supposedly the word “russ” is derived from the Danish word for intoxication. Today, the Norwegians have proudly taken this hazing into their own hands, and graduates wear overalls that are color-coded for their intended field of university studies (red = general, green = agricultural, blue = finance and administration, etc.) Students spend the whole last month of high school partying all night on Russbusses (rented party wagons), fulfilling crazy drinking challenges, sleeping on public parkways, and being met by their parents each morning with bowls of porridge that will theoretically soak up all the alcohol and help them get through final exams. The fun finally ends on National Day, to everyone’s great relief. You can see that this little girl is thrilled about wearing her bunad. 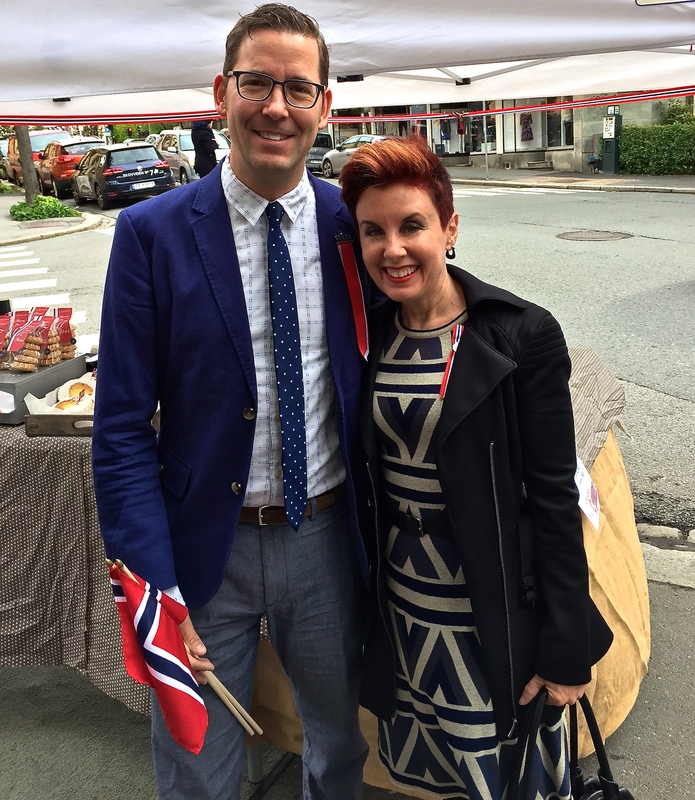 Another big difference between Norwegian and American independence celebrations is the attire. In the U.S., you’ll see people wearing red, white, and blue, but that’s about as close as we come to having a national costume. 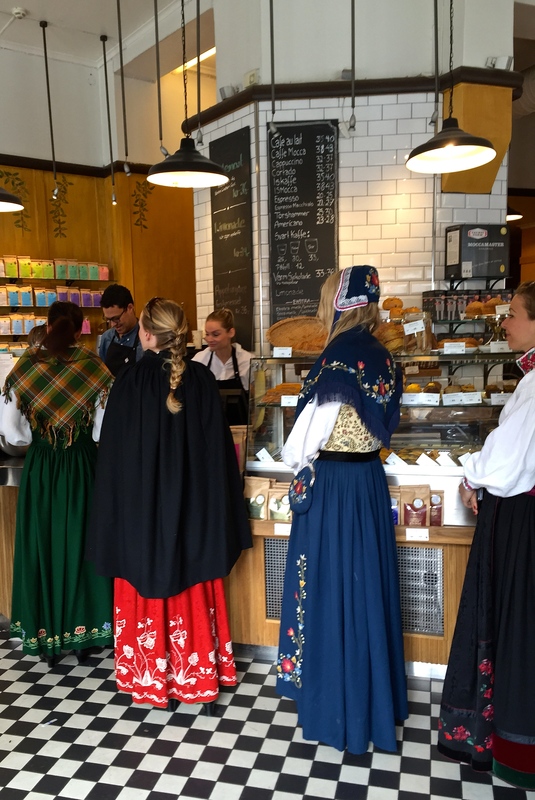 However, in Norway, many folks use the occasion to don their bunad (BOO-nod) — costumes representing their ancestral provinces. 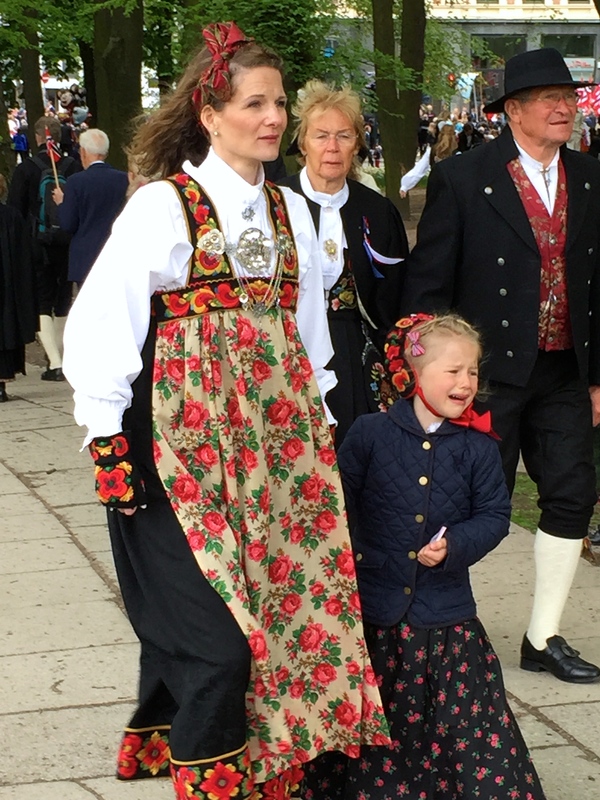 By the way, these outfits aren’t just pulled out of mothballs once a year for National Day; Norwegians sport them for every special event, including weddings, christenings, Christmas, Easter, you name it. Practically every weekend we see folks wearing bunad on the street for one occasion or another. No, it’s not a Mennonite convention. It’s just Norwegian ladies grabbing a coffee to-go before the parade. For women, their ensembles usually consist of some kind of elaborate headdress, bonnet, or scarf; a white peasant blouse paired with any combination of brightly-colored pinafore, jacket, shawl, vest, or cummerbund; plus a woolen skirt and purse. All of these items are hand-embroidered with incredibly elaborate patterns that give you clues as to the origins of the wearer. Intricate gold and silver jewelry resembling ancient Viking brooches and clasps ornament the bodices of the blouses and complete the look. Men’s and women’s outfits from Hardanger, Norway. Men get in on the action, too, sporting fancy knitted socks, woolen knickers and jackets, embroidered waistcoats, and knitted caps or top hats (both Abe Lincoln and Pilgrim styles abound.) Black Pilgrim shoes with silver buckles are traditional for both men and women, too. On the whole, the overall effect is Victorian, which is when most provincial design themes became cemented in the public identity. And these outfits aren’t cheap. I’ve been told they start at about $4,000 American dollars, but many folks spend $20,000 – $40,000. Tradition says that you’ll receive your first real bunad as a gift at confirmation when you turn 15. It’s usually a bit big so that you’ll grow into it, but it’s not uncommon for folks to purchase another outfit later in life to accommodate a change in marital status, a growing girth, or a desire to represent some other branch of the family tree because they like that outfit better. (I’ve been told that some wannabes turn genealogical cartwheels in an effort to establish a blood connection to their favorite bunad design.) Click on the photos below for closer look at costumes and customs. 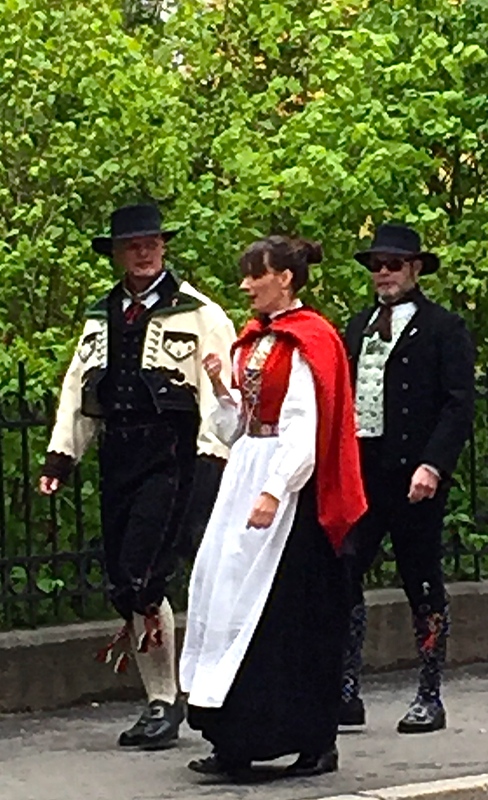 The woman on the left is wearing a bunad from inner Sogn. Check out the incredible silverwork on this bunad. A bunad from East Telemark. Don’t know where this guy’s bunad is from, but I love the socks! How’s this for matching outfits? A bunad from Setesdal in southern Norway. Boots of a Sami outfit. More fabulous jewelry. This stuff’s real gold and silver, kids. An amazing apron and jewelry. Two girls in bunad from Graffer in southern Norway. There are bunad stores on almost every other block. A committee (jokingly called the bunad police) sets the rules each year about what constitutes authentic bunad design. Feeling fine in our National Day best. But if you don’t have the desire to spend three month’s pay on a bunad, it’s expected that for National Day you’ll at least put on a suit or dress, along with a lapel pin trailing red, white, and blue ribbons — which is exactly what Matthew and I did. And this brings us back to the actual celebrations. Matthew and I have now experienced two National Days, and I have to say, it’s worth it to plan a visit around the holiday just to partake in the fun. Last year, Matthew and I were lucky enough to get seats right in front of the palace so we could witness the spectacle up close and personal. 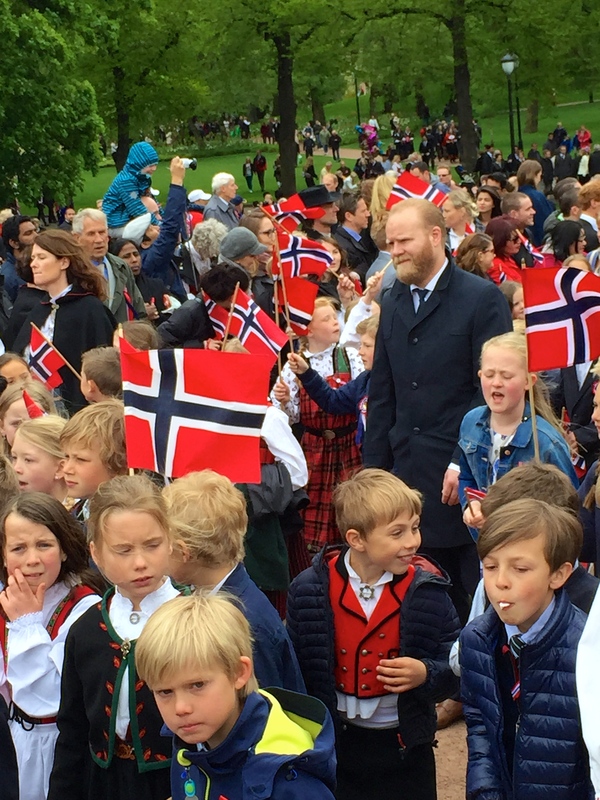 We sat their for hours — it seriously takes about five hours for all the Oslo schools and their marching bands to parade past the royal family (who are also dressed in bunad). Note how the kids lower their flags parallel to the ground as they pass by the king. It’s pretty interesting to witness imperial protocol. 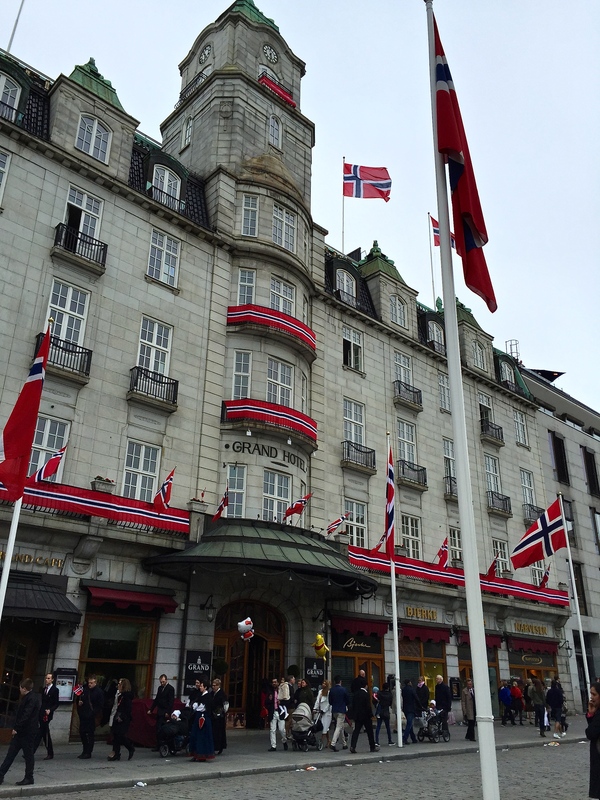 As groups approach the balcony, they lower their school flags parallel to the ground to honor the king as sovereign over the Norwegian people and the state. The King and Crown Prince tip their top hats in return, while the ladies give the same sort of royal wave that Queen Elizabeth has now made famous. The kid in the russ overalls blends right in with the band uniforms, doesn’t he? The band music itself is quite entertaining, too. While everyone at some point plays or sings the national anthem, Ja, vi elsker dette landet (Yes, We Love This Country), Michael Jackson is clearly the crowd favorite. I can’t tell you how many bands I heard performing, “I’m Bad,” “Billie Jean,” “Beat It,” “Pretty Young Thing,” and even “Thriller.” Very surreal. Last year, we finally sought shelter from the stumbling crowds in what we thought was a quiet restaurant advertising a smorgasbord. We went in, filled our plates with salmon and shrimp smørbrod, paid our fee, then wandered around the room admiring the nautical flags, model ships, and domed ceiling painted with constellations (which should have been our first clue). Only after a guy began clanging a bell and everyone stood up to sing the national anthem, followed by a gentleman in a uniform giving a speech entirely in Norwegian, did we realize we’d party crashed some event honoring a naval captain. Oops. 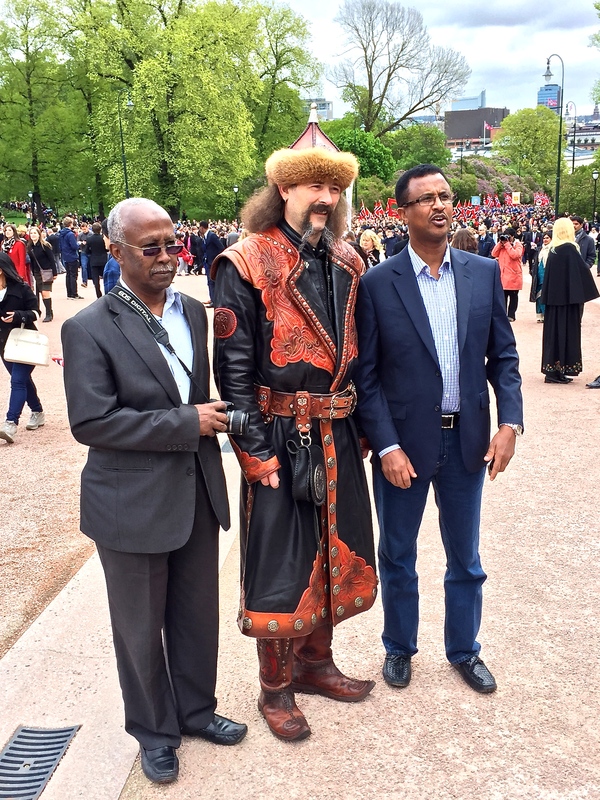 And on that note, I leave you with some more photos of National Day to give you the flavor of the celebration …. Looking down Karl Johans Gate towards the palace. A band marches down our street to join the parade. It’s just a little crowded along the parade route. King Harald V and the royal family wave from the balcony. Lots of schoolkids of other nationalities participate in the parade, which helps dampen the anti-immigrant sentiments that have sometimes been an issue here in Norway. Girls weren’t allowed to join the parades until 1899. This guy’s so happy to be Norwegian. Even the statues get dressed up. This guy wins the sartorial prize. There are a couple of hilarious “Lilyhammer” episodes on National Day and the whole graduation ritual, worth watching.